We have been hosting our award-winning expert-led wine tasting evenings in London and Bristol for over a decade, and more recently in eight other locations - Cardiff, Liverpool, Birmingham, Manchester, Leeds, Sheffield, Leicester and Norwich. ThirtyFifty's wine tastings can be booked onto with open-dated gift vouchers which make a great birthday or Christmas gift or can be booked directly if you know which date you'd like to attend. The object of the wine tastings is to share our knowledge so that you can learn the important bits about wine to help maximise your wine drinking pleasure! You'll also meet like-minded wine drinkers and learn in a small group of up to 16 people in an informal setting. Our wine tastings in London are held at Brasserie Blanc, 9 Belvedere Road, Southbank SE1 8YP and at Browns, 82-84 St Martin's Lane, Covent Garden WC2N 4AA. In Bristol we are at Browns Brasserie and in Cardiff we are at Le Monde, St Mary Street, CF10 1FE, in Liverpool at the Jurys Inn Hotel, Keel Wharf, L3 4FN in Sheffield at The Milestone, Green Lane, S3 8SE in Leicester at the City Rooms, Hotel Street LE1 5AW and in Norwich our events are held at the Dining Rooms, St Andrews Street, NR2 4AD. The evenings are priced at £39 per person and include antipasti or canapés served during the tasting. Please check below for forthcoming dates. For 2018/2019 we are continuing our Friday night Wine Tasting Supper Club at Browns in Covent Garden. The evening includes wine tasting along with a supper comprising a main course (vegetarian option available) followed with cheese and starts off with a glass of fizz on arrival. Each month we'll taste a different line-up of wines and cover different topics. The evening is priced at £49 per person. Please check below for forthcoming dates. You can either book for a specific date from the list below or, if you are purchasing as a gift, you may want to give an open dated gift voucher which is valid for 24 months after purchase. If you book a specific date we will send you a voucher for that date. The vouchers are sent by email with free delivery or a printed voucher can be posted for an additional charge of £2. A great starting point and good fun, covering the basics of wine and wine tasting with 7 wines to taste and antipasti/canapés. How to taste wine like a professional! What to look for in wine and how to recognise key components - tannins, acidity, sugar, alcohol. How to evaluate quality with our one second trick for valuing a bottle of wine. How wines age and when is the best time to drink them before they go past their peak. Tips on buying, storing and serving wine and food & wine matching. Taste 7 very different styles of wine to find out which styles you like best! Discover why you like these wines and how to find others just like them. Antipasti/canapés will accompany the wines. Find out how your taste buds affect your preferences. Know how to spot the key wine styles of the world. Top tips to discover a wider range of wines of a similar style. Confidence to experiment with wine regions and grape varieties. Once a month we'll be hosting a Friday night wine tasting with supper included - only available in London. Each time there's a new line up of wines to discover and different topics. During the tasting supper will be served comprising a main course (with a vegetarian option) and cheese matched to wines. Find out how to taste wine like a professional! Take part in blind tastings and a fun quickfire quiz. Learn more about how wines are priced and price in relation to quality. Pick up tips on storing and serving wine and food & wine matching. We'll taste a range of 6 styles of fizz for you to discover the main differences and pick your favourites. Antipasti platters will accompany the wines. How do the bubbles get into the wine? How the different methods affect the taste. Blind tasting of Champagne vs Fizz. Tips on buying, storing and serving bubbly. 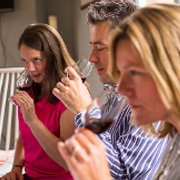 Our evening London wine tasting courses are both refreshing and fun, but also easy for enthusiastic amateurs to get a real solid grounding that will help them navigate the world of wine with confidence. Tastings can be attended as a one off tasting or as part of a series of evenings to build knowledge. In addition to tasting some delicious wines there are antipasti or canapés to enjoy. In London we have a Friday Wine Tasting Supper Club with the wine tasting during a main course and cheese course. Click this link for a full list of all ThirtyFifty's Wine Tasting Courses and Experiences in London. To book an evening tasting select the date you'd like to attend below to add to your basket. In addition to tasting some delicious wines there are platters of antipasti to tuck in to! Follow for a full list of our different Wine Tasting Courses and Experiences in Bristol. To book select the date you'd like to attend below to add to your basket.